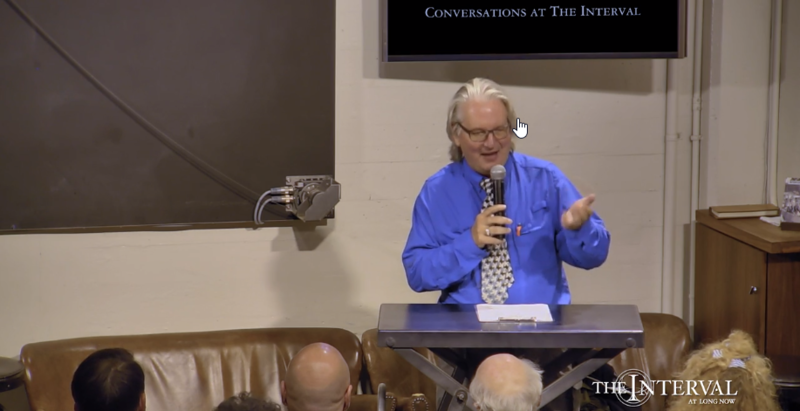 Bruce Sterling is a futurist, journalist, science-fiction author, and culture critic. He is the author of more than 20 books including ground-breaking science ficiton and non-fiction about hackers, design and the future. He was the editor in 01986 of Mirrorshades: The Cyberpunk Anthology (1986) which brought the cyberpunk science fiction sub-genre to a much wider audience. He previous spoke for Long Now about “The Singularity: Your Future as a Black Hole” in 02004. His Beyond the Beyond blog on Wired.com is now in its 15th year. His most recent book is Pirate Utopia. Previous Previous post: Why Are Young People Pretending to Love Work?